Care Takers was produced by Truant Company and funded by Arts Council England. It was written and directed by Billy Cowan and starred Penelope McDonald and Annemarie Bayley. Penelope Mcdonald was nominated for Best Actress for her role as Mrs Rutter at the Dublin Gay Theatre Festival. 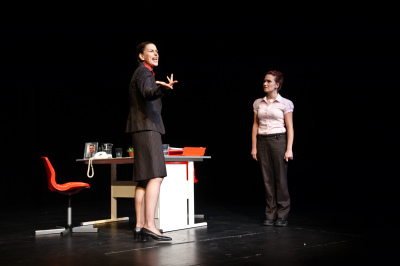 It toured to The Lowry, Salford; Oldham Coliseum; The Dublin Gay Theatre Festival; The Unity Theatre as part of Homotopia; An Tain in Dundalk and it was chosen as one of the best studio plays of 2009 by The Library Theatre Manchester and was remounted for their Re:Play festival in 2010. "Hits home with a punch! This show deserves to reach a bigger audience than the studio format allows. Go see it." Those who care, aren’t the ones who stay. Ms Lawson, a new teacher at St Margaret’s High School, believes Jamie Harrow is being bullied because he’s gay. She wants to help, but Mrs Rutter, the Deputy Head, thinks it will sort itself out. Is she speaking from experience or is there something more unsavoury about her unwillingness to help? "An insightful, provocative and plausible look at a thorny, but relevant, topic."